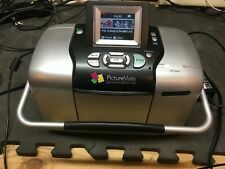 Epson PictureMate 500 Digital Photo Photograph Inkjet Printer Including PSU and Cables. Fully working order. Needs new cartridge. Has some minor cosmetic scratches etc from storage and is a little dusty. See pictures for specifics as they represent the actual item you are getting! Please check out our other items! 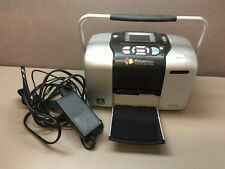 Preowned printer. Printer only, no power cord included. Model B351A. 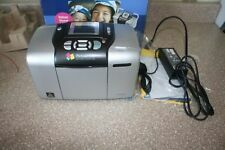 Printer Type Digital Photo Printer. Output Type Color. 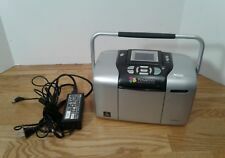 Extend Printer Technology Color Laser. Key Features. Technical Features. Product Identifiers. Powers on. Front 2 doors, noted in last 3 pictures Have minor issues. The inside of the middle black door has a crack. The outer door is magnetic to close, but when opened it opens slightly crooked as the inner left hinge is broken. Untested, since I don't have a power cable for it. Sold as is. BELIEVE THE PRINTER STILL WORKS. LOST CORDS IN A MOVE. PRINTER WORKED BEFORE WE LOST THE CORDS. GREAT DEAL!